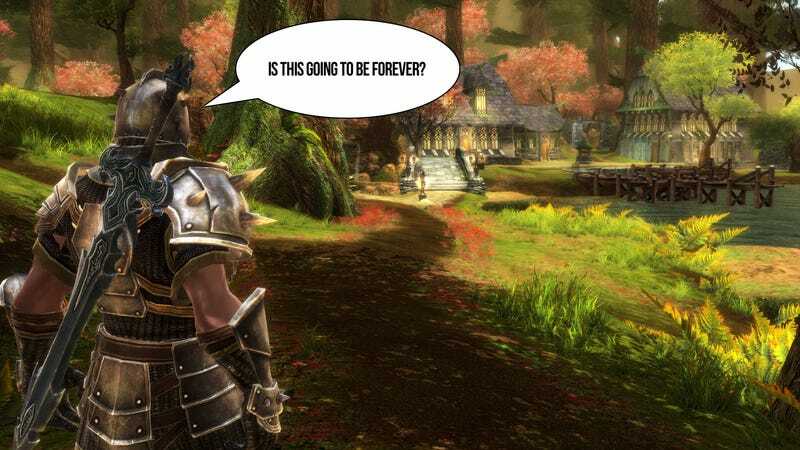 Perhaps proving that you can have too much of a good thing, a recent total completion playthrough of Kingdoms of Amalur: Reckoning clocked in at more than 200 hours, which has the lead designer wondering if maybe they might have overdone it a little. One would think more than 200 hours of content would be one of the big selling points of an open-world role-playing game like 38 Studios' Kingdoms of Amalur: Reckoning. Speaking to Strategy Informer at a recent EA event, lead designer Ian Frazier said that even the quality assurance folks that have been playing the game for months and know how to cut corners took more than eight days total playtime to experience everything the game had to offer. "That means easy difficulty, skip all cut scenes and dialogue, sprint everywhere that's sprintable, fast travel everywhere you can, don't do any combat you don't need to do… that all took around 200 hours, and that was a speed run." For a normal player that might seem like a great deal of value. As the Kotaku writer assigned to review the game, it makes my stomach hurt, especially after just finishing up Final Fantasy XIII-2. Luckily for me the main quest in Amalur only runs 30-40 hours. I'll do my best to finish the core quest, but I can't see myself investing 200 hours in this world, which leads me to think that Frazier might be onto something when he wonders if his team went a bit overboard. "I think in terms of a selling point – bang for your buck – I think it's great. It should be on the back of the box. But as a developer I have to look at it and think "did we overdo this?" I really don't know."